I wasn’t quite sure what to expect with this new crime novel, after all it takes something quite spectacular to live up to the billing ‘the crime debut of the year’ especially as it is only February! To begin with we have the DI, Marnie Rome who has a troubled past. So far so normal for a crime novel, but in her case her back story include murdered parents which has left her determined to succeed in her job, although her personal life seems a little bleak. Her partner is DS Noah Jake, a Jamaican and gay, this presents no problems except with DS Ron Carling who is the macho policeman. However this is much more than a formulaic police procedural, this book is as much about why some of the crimes are committed as it is about how they were, and who did it. Desperate to bolster their case against a suspect, DI Rome and DS Jake visit a woman’s refuge; they need the resident to make a statement about her treatment at his hands and walk in to find a man lying stabbed on the floor. The action starts with a bang but this turns out to be a nightmare of a case to investigate, the women are far from ideal witnesses but DI Rome is determined to find answers. Set mainly in London in the present day with enough local references to anchor the reader, I would love to visit Marnie’s favourite café which sells French toast with cutlery warm and wrapped in a thick linen. There is a little jumping back in time mainly in relation to Marnie’s past but also a few excerpts from an unknown man set six months previously. These are all clearly headed so there is no risk of confusion. This is just the sort of book I enjoy, there are so many different stories all playing out; those of Marnie, Noah, the social worker Ed and the female residents have clear personalities and stories to tell without slowing down the pace or preventing a bucketful surprises along the way. I lovely a book that makes you gasp and this one did. I literally worked out one bit of the puzzle a page before the reveal and it still shocked me. Not bad for someone has read as many crime novels as I have. This was a brilliant read and I do hope this isn’t the last we hear of DI Rome as I for one thoroughly loved this protagonist as well as the reassurance that the crime genre still has a lot to offer its readers. For once I don’t think the publisher’s have got their claims wildly wrong! I was extremely lucky to receive a free copy of this book from Lovereading as I am on their reviewing panel. 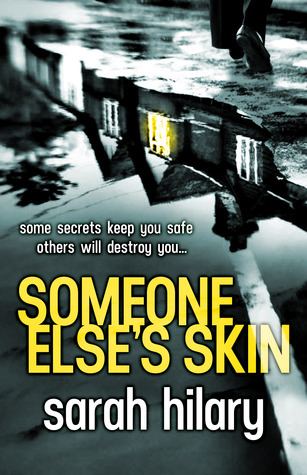 Someone Else’s Skin will be published by Headline on 27 February 2014. Sounds like a good read. It’s been ages since I read a good thriller. It was a well-deserving addition to the Richard & Judy bookclub, with far more depth to the story than I expected from a debut.